By default, all incoming spam messages are directed to spam folder and marked as unread. 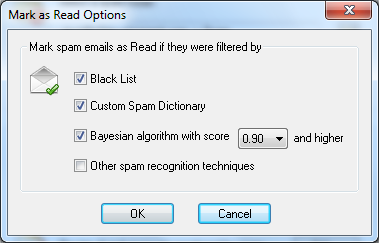 In order to help users to easy distinguish 100% spam from "not sure" spam emails Spam Reader allows to mark "as Read" only those spam messages which were filtered by particular, trusted algorithms. You can customize the list of trusted algorithms on General tab of program options.